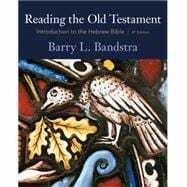 Learn how to actively read and understand the Hebrew Bible and its significant literary, historical, and thematic meanings with the help of this bestselling introduction to the Old Testament and its companion website. READING THE OLD TESTAMENT: INTRODUCTION TO THE HEBREW BIBLE, Fourth Edition uses a wide selection of maps, charts, timelines, and artwork to ensure your understanding. Chapter-opening summaries and reading guides direct your attention to key concepts, historical contexts, and relevant Biblical passages. The accompanying website provides the entire text of the Bible, the entire text of the textbook, and an interactive study guide with numerous study tools for your convenience.